Compute the correlation coefficient between two variables. A perfect linear relationship yields a correlation coefficient of +1 (or -1 for a negative relationship) and no linear relationship yields a correlation coefficient of 0.
with r denoting the computed correlation. The pvalue is 1 - CDF. This syntax computes the absolute value of the correlation coefficient. This is typically used in screening applications where there is an interest in identifying high magnitude correlations regardless of the direction of the correlation. This syntax computes the pvalue (described above) of the correlation. This syntax computes the cdf (described above) of the correlation. The two variables must have the same number of elements. CORRELATION MATRIX = Generate a correlation matrix. RANK CORRELATION = Compute the rank correlation of two variables. KENDALLS TAU = Compute the Kendall tau correlation of two variables. WINSORIZED CORRELATION = Compute the Winsorized correlation of two variables. BIWEIGHT MIDCORRELATION = Compute the biweight mid-correlation of two variables. PERCENTAGE BEND CORRELATION = Compute the percentage bend correlation of two variables. COVARIANCE = Compute the covariance of two variables. PARTIAL CORRELATION = Compute the partial correlation of three variables. PARTIAL CORRELATION MATRIX = Generate the partial correlation matrix. 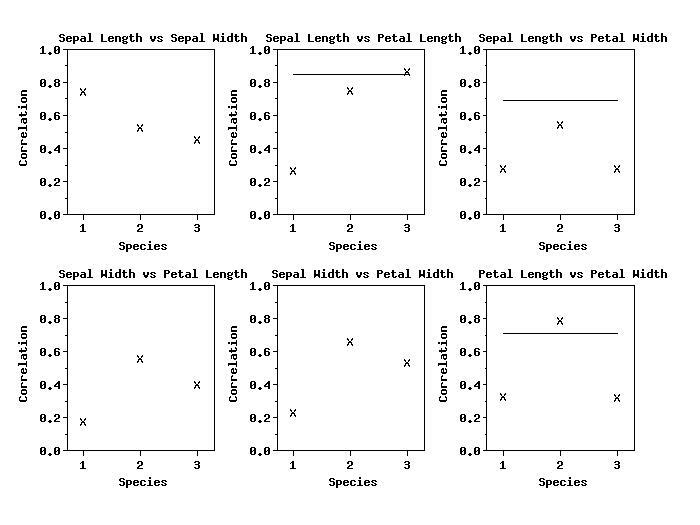 CORRELATION STAT PLOT = Generate a correlation vs. subset plot. Consult any introductory statistics text. Peavy, Bremer, Varner, Hogben (1986), "OMNITAB 80: An Interpretive System for Statistical and Numerical Data Analysis," NBS Special Publication 701.